No, that’s not an ’80s metal band. It’s a herd of cows. 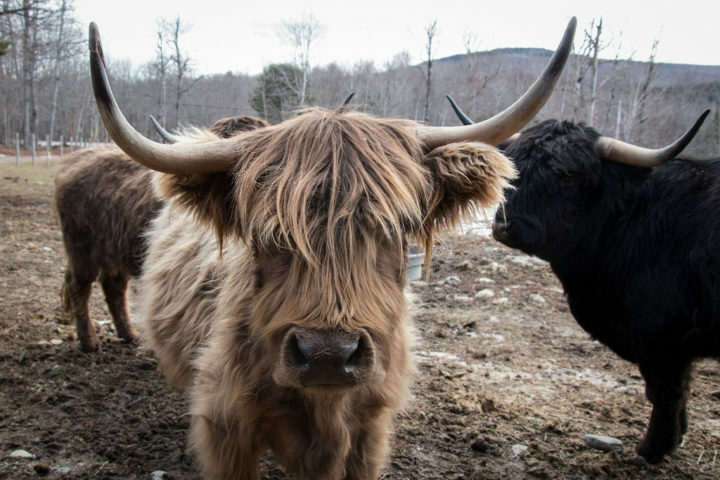 With thick shaggy coats and long curved horns, Scottish Highland cattle are built to withstand the harsh climate of the mountains — the wind, the rain and the cold. For countless generations, this stocky animal has been prized by the Scottish for its hardy nature, gentle temperament and the lean beef it produces. For Dan Hughes, who became a farmer late in life, the animal has been a way for him to connect to his heritage and produce grass-fed beef for his community. Hughes and his wife moved from Boston to Maine in 2002 after their children had entered college. Embracing country living, he purchased four Scottish Highland cattle from a farm in northern Washington County with the intentions to raise the cattle for his own joy, and to educate others. “I’d take them to fairs and talk about the breed, and I’d wear my kilt — because I have bonnie knees, you know,” Hughes said with a chuckle. Dan Hughes, owner of A Wee Bit Farm, feeds his Scottish Highland cattle a special treat of grass and alfalfa pellets on Dec. 4 at Wee Bit Farm in Orland. It wasn’t until Hughes had one of his cows slaughtered for its beef that he considered making a business out of what his hobby. Multiple studies support Hughes’s claim, including a well-circulated 1997 study led by the Scottish Agricultural College that compared Highland cattle beef to other beef on the market. The study found that in addition to containing less cholesterol and fat, Highland cattle beef contained more protein and iron than average store-bought beef. Also, a 2011 study conducted at the University of Glasgow found Highland cattle scored higher in beef tenderness than other beef, and that Highland beef contained notably more iron and protein than other beef. However, that particular study found fat differences to be complex, and while the study found Highland beef to contain 4.1 percent less cholesterol than other beef, the author deemed that difference to be insignificant. “People do love it,” Hughes said of his Highland beef products. With his grass-fed Highland cattle, Hughes produces prime cuts of steak, ground beef and sausages, which he sells to local stores, including G and M Family Market in Holden, Tiller & Rye in Brewer and the Natural Living Center in Bangor. He also sells his meat to local high-end restaurants, including The Fiddlehead Restaurant in Bangor. A young Scottish Highland cattle named Kaven stands with his herd on Dec. 4 at Wee Bit Farm in Orland. 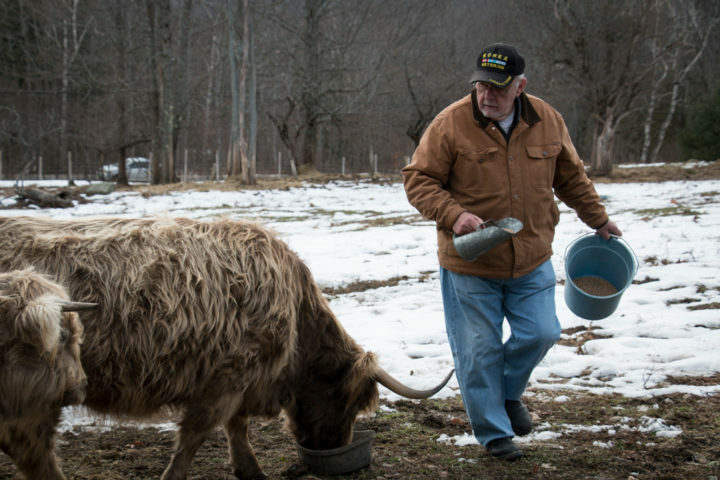 Over the years, he has expanded his herd, so that he now keeps Highland cattle, along with Icelandic sheep, Katahdin sheep, and Yorkshire and Berkshire pigs. These animals are spread among seven farms throughout Maine with which Hughes has established mutual agreements. And he continues to raise a small herd of Highland cattle at his home in Orland, with their hilly pasture located right in front of his house. Hughes explained that he’s not really in the businesses for profit. He enjoys working with other farmers, offering grass-fed meat to his community and performing the simple tasks of farming. A particularly large Highland cow raised her head and stared in Hughes’ direction with big brown eyes, her horns curving outward and up on both sides of her head. Boudica, who he named after a Celtic warrior queen from first century, holds a special place in his heart. She’s been a part of his at-home herd for several years and has birthed multiple calves, including Kaven, the youngest in the herd, his horns just peeking out from under his long hair. Hughes entered the pasture through a shed, then walked confidently through the group of cattle with a bucket full of grass and alfalfa pellets — a treat for rare occasions. For the most part, his cattle simply feed on grass, he said, and throughout the winter, bales of hay. References to Highland cattle go back to the 12th century, though some researchers believe the breed existed in the British Iron Age (the period from about 800 BC to the Roman invasion of Britain in 43 AD). It’s thought that the breed was brought to the East Coast of the United States in the 1920s. In 1948, the American Highland Cattle Association was formed. Since then, the hardy creature has developed a big following throughout the country. In Maine alone, Hughes said, there are several farms that raise the breed. Scottish Highland cattle wander the pasture on Dec. 4 at Wee Bit Farm in Orland. 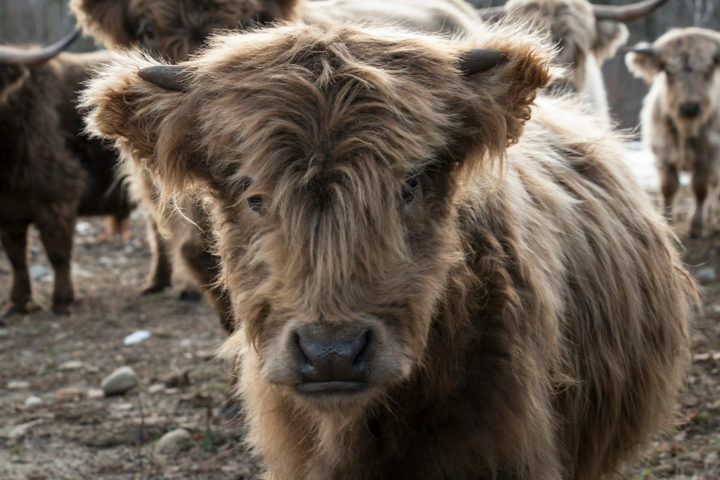 With an average weight of 1,100 pounds, Highland cattle come in many colors, and Hughes herd was a good example of this diversity, with shaggy coats of auburn, beige, black with red highlights and creamy white. The breed is so hearty that it doesn’t require housing, even during the Maine winter, Hughes said. They stay outside all year round, often bedding down in hay scattered over the snow. “They don’t even want to be inside,” he said, remembering a time he brought them to a fair and they seemed uneasy while under shelter. Following Hughes through the snow and mud, the cattle mooed and clacked together their giant horns. He distributed the pellets in large bowls spaced out in the yard, and the cattle bent their heads to eat.